Indianapolis, Indiana USA : Guru Nanak is regarded by the Sikhs and many others as a Messenger of God, an enlightened Teacher, a champion of human dignity and peace among faiths, and a brilliant spiritual Light for all humanity. Guru Nanak, the Founder of Sikh faith, was born in 1469 at Nankana Sahib, near Lahore in the Punjab, India (now in Pakistan). The Sikh community around the world with family and friends will gather in homes, Gurdwaras (Sikh Temples), at religious sites, ceremonies, and faith forums in early November to celebrate the 545th Parkash Divas (Birthday) of Guru Nanak Devji. Many people from other faith communities will join in these celebrations. My earliest recollection of this high holy day for the Sikhs comes from my childhood when my father Giani Joginder Singh from Jaranwala (now in Pakistan) would take me, my elder brother Gur Pratap Singh, and a group of his friends to lead the Joray Seva (taking care of the shoes) of lakhs of pilgrims that would gather in Nanakana Sahib at the time of the Gurpurab (birthday celebration) of Guru Nanak. As a young child, this was an amazing and memorable experience. Each time I think about venerable Ragi Bhai Summund Singhjee singing this hymn: “SutGuru Nanak Purgattiya, Mittee Dhund Jugg Channun Hoyaa: A Divine Teacher Nanak has taken holy birth; a great fog is lifted, and the world is bathed in divine light,” around midnight, close to the hour of Guru Nanak’s Parkash in this temporal world, my heart and spirit is moved by the beauty of that moment, reverentially magnified by Bhai Sahib’s divinely-blessed voice and hauntingly rich rendition of this hymn by a venerated Sikh poet and scholar, Bhai Gurdas. For one brief moment, one saw a celestial Light descend in that sacred space of the Janam Asthan (place of birth) of Nanak; the heart and spirit of the hundreds of thousands of faithful gathered swept away by the indescribable spiritual exultation of the moment. This is a treasured memory I share with countless millions. My father was my early mentor and remains my guiding light; he introduced and taught me much about the Sikh faith and some of our illustrious ancestors. The Partition of India in August 1947 separated millions of Sikhs from that annual pilgrimage to the one of the holiest sites of the Sikh faith. Today, the Government in Pakistan allows only a few hundred Sikhs each year to visit Nankana Sahib for Guru Nanak’s Gurpurab and other major religious celebrations connected with Sikh Gurus. Sikhs would be enthusiastically celebrating and commemorating the occasion: the life and times of Guru Nanak, his personal testimony and travels; listening to Guru’s all-embracing message in Shabad-Keertan (singing of Holy Word and praises) at massive gatherings, participating in religious discourses and prayers for the well-being of humanity. All present will be share a community meal (Langar), a tradition introduced to the world by Nanak at a very young age over five centuries ago. Prominent Sikh and non-Sikh scholars have for centuries engaged in the study of the life, teachings, and sacred writings of Guru Nanak. I am not qualified to make any such claim. I am among the millions of admirers of the Great Guru, and I humbly offer my tribute inspired by my limited understanding of the Guru’s message and its significance to our times and place in the spiritual journey of human civilization. As we remember and honor the life of Guru Nanak on this sacred occasion: may we discover our own responsibility to walk in his enlightened footprints, honor his commandments; stand up for life, liberty, justice, universal civil and spiritual freedoms. Pray for the well-being of fellow beings with diverse cultures and traditions; engage in righteous labor and share our blessings with the hungry, homeless, and those in difficult circumstances. Together, engage in dismantling all unworthy and unconscionable boundaries; building bridges that serve causes and mandates larger than our own faith, culture, or personal prayer. May we remember Guru Nanak’s message of humility, sweetness in temper; his call to conquer self, formidable temporal distractions and challenges; honor Truth and practice Truthful Living; and relate to and respect one another as One God’s Children. May this Divine Wisdom as revealed in Guru Nanak’s marvelous hymns and exalted poetic compositions and incorporated in the Sri Guru Granth Sahib (the Sikh Sacred Scripture), inspire humanity through the ages, in message and music, in places and forums that we could not have imagined a few decades earlier. May we enshrine the lessons of faith deep within our souls to guide our lives to a path that leads to knowing God and fulfilling the supreme goal of human birth: serving humanity and the blessing of an ultimate reunion with Waheguru (One Wonderful Lord), a place at His Lotus Feet. 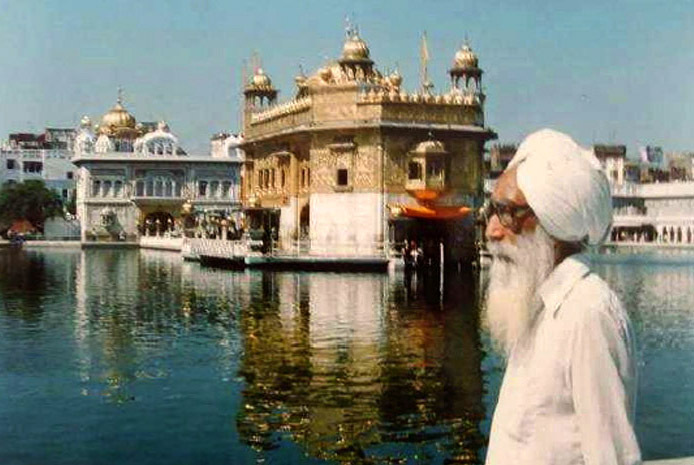 During his lifetime, Guru Nanak extensively traveled and carried his message to the world, to the centers of major faith traditions: throughout India, Sri Lanka, Tibet, China, Mecca (Saudi Arabia), Baghdad (Iraq), [some believe: Jerusalem and Cairo (Egypt)], Turkey, Tehran (Iran), and Kandhar and Kabul (Afghanistan) among many other places. We can be certain that Guru Nanak encountered rough terrain and dangers, hostile tribes, unfamiliar languages, unfriendly kingdoms and audiences. Nanak also received unexpected welcome, participated in illumined robust discussions with religious scholars during his travels, shared his message of the unity of human spirit stating that all Creation is the amazing masterwork of One Immaculate Reality that is universally benevolent toward all. Today, the Great Guru’s over 35 million followers (Sikhism is the fifth largest faith in the world) are on every continent and in many countries, including nearly one million in U.S.A. As the newest generation of pioneers, we have a responsibility to share the unifying message of Guru Nanak, the Sikh history and traditions with generations in new lands and in different times: feed and serve the hungry, dispossessed, and disenchanted; be champions for those who suffer under tyranny, injustice, denied basic rights and human dignity; help safeguard the life-sustaining and natural environment for all living beings as an honor to the Supreme Creator who is present all around in myriad manifestations: Nature is the Crown and “resting place of the Creator”-SGGS. We must face these and other contemporary challenges as a test of faith; a blessing to celebrate our intertwined destiny as a preordained spiritual and cultural pilgrimage. It all begins with building bridges towards other major faiths and spiritual traditions: seeking peace with one another, dismantling long-standing divisive and unworthy misunderstanding and unfounded stereotyping. Discover common threads that help unify our amazingly diverse landscapes at new unfolding crossroads. Creating an environment where learning, as the Great Guru taught (the word Sikh means a disciple and life-long student), must remain a central focus and principal commitment of Sikh life. If we want others to know about Sikhs, then ignorance of our history, proud legacy, continuing indifference or further neglect of precious heritage, disintegrating sacred relics and rare texts, are areas we must tackle with urgency. The Sikh faith, particularly in Diaspora, is at significant unfamiliar thresholds, facing new struggles that come with being thrust into a very different and changing world. There are unprovoked threats to the Sikh identity and Sikh faith-mandated sacred articles. We must address these challenges by learning about the governing laws, constitutional safeguards, civil guarantees, time-honored ideals and traditions. We must mainstream our presence and visions, talents and experiences, and become responsible partners to solve common problems and those that originate from unfamiliarity and misinformation. Let the founding principles of the Sikh faith and the shared precepts in humanity’s collective sacred heritage lift the spiritual and cultural fog that often separates us from one another. May we recognize and honor that: “Every living being is a repository of the same Divine Light,” and there are no limits, strangers, or distinctions that “make one person holy and another not worthy”- Sikh Scriptures. May the Divine Wisdom and Universal Truth revealed to Guru Nanak and the succeeding Nine Sikh Gurus, who nurtured the faith and reverentially enshrined their teachings in Guru Granth Sahib, regarded as the Eternal Guru of the Sikhs and an embodiment of the spirit of Ten Gurus be our living Guide, as commanded by the Tenth Sikh Guru Gobind Singh before departing from Nanded in October 1708 for his heavenly Abode. Divine Messengers, enlightened souls, and great humanitarians illumine our path and connection to God. They belong to the entire human race and to all generations. Congratulations to the Sikhs and our friends of in other faith communities on the auspicious occasion of 545th Gurpurab of Guru Nanak.